Today’s card is one I made for a group Blog Challenge – the idea was to copy a cards layout – you could change the stamps, ink, and card stock – but you should keep the actual layout in place. The original card can be found on page 10 of the Fall/Winter Preview Catalog – it is shown using the Year after Year stamp set. ETA - I've had a few people inquire about the "Bloggers Challenge". This was something I thought would be fun to do with some of my blogging friends. The orignal group members are girls that I've been swapping with on a yahoo group. There are a few more bloggers joining us in the next Blog Challenge. A Challenge is given to all who wish to play (it's not mandatory) - you have until Friday to upload your challenge card to your blog using that weeks challenge - then post the links to the other players blogs. I set up a yahoo group for ease of communicating with the Blog Challenge Players. If you are interested in joining, just send me an email. Very cute card Lisa! I'm going to work on mine this evening/tomorrow morning. Darling card, I love anything with polka dots. Great idea, stamping your favorite samples in the catalog, I need to do some of my fav's so I have one in my hand. Thanks for sharing with us. love it Lisa - I keep eyeing this stamp set!! love your card Lisa! can't wait for the next challenge. What a great idea, Lisa! I love the idea of a Bloggers Challenge! 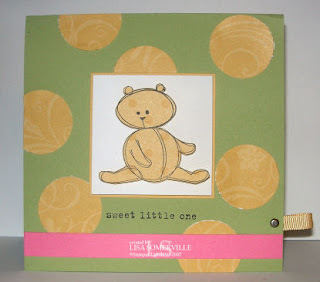 Great card...that is the best baby set I've seen in a LONG time! Very cute! Could you tell me more about the Blogger's Friday challenge?